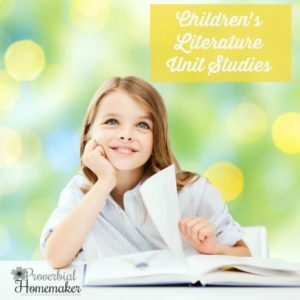 This fantastic unit study is a part of the Children’s Literature Unit Study series on Proverbial Homemaker. 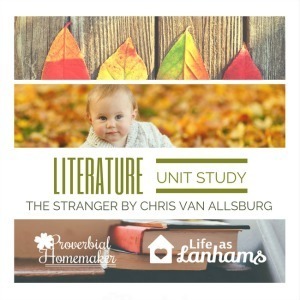 Check out all the unit studies already available and be sure to subscribe as we’ll be having NEW unit studies each week through November 2016! I love a good mystery – Nancy Drew, the Hardy Boys, Encyclopedia Brown – you name it, I probably read it as a kid. So when I came across this book I was instantly hooked. I was browsing the books in my library’s children’s section when I came across a book called The Stranger. It had an interesting cover illustration, and it was written by the same author as another timeless favorite, The Polar Express. After taking a closer look, I decided to take it home with us. As I read it to my kiddos, we were intrigued by the mystery and the wonderful story of the stranger who visited the Bailey family for a few weeks after an accidental encounter on the road. Who is this mysterious stranger? Personification – Personification is when an author gives human characteristics to an object or idea. Here are some examples of this language technique. How is this book an example of personification? Why might it not be considered personification? Poetry – Find some wonderful poetry to celebrate the season. 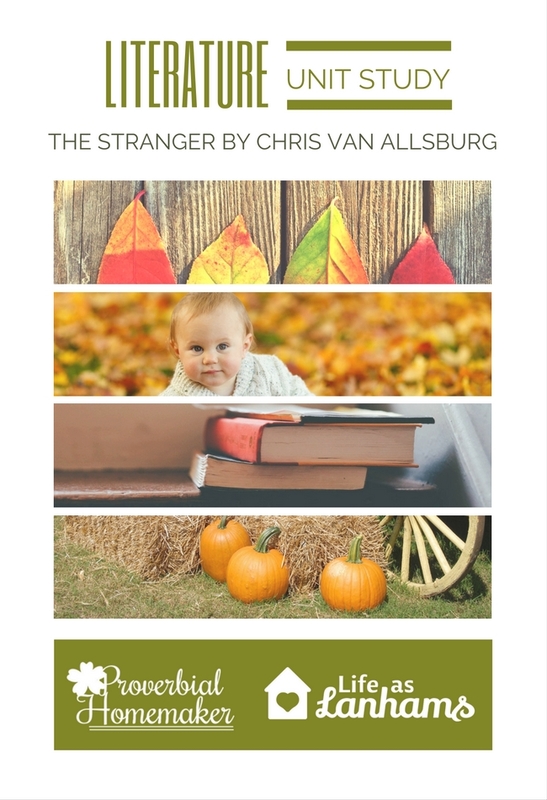 Find out why the leaves change – In the story, it seems like the stranger’s job is to help the seasons change. Maybe he is Jack Frost, or maybe he’s just a personification of Autumn. Is this really how Fall comes? How does the changing of seasons really happen? What would happen if the seasons didn’t change like they should? Go on a nature walk – Enjoy the cooler weather of the season, and gather up some leaves, pinecones, and acorns for some great art projects! Did you see any animals while you were on your nature walk? What were they doing? Preparing for Winter – How do the animals in your part of the world prepare for winter? Are the squirrels gathering nuts? Is your dog’s fur getting thicker? Are the birds flying south? Draw a picture of the animals preparing for winter. Steam – The stranger was mesmerized by the steam coming from the soup Mrs. Bailey served. Why do hot foods create steam? Talk about how water can take on any of the forms of matter – solid (ice), liquid (as water), and gas (steam). This would be a good time to have a big bowl of soup for dinner! Body Temperature – The doctor took the stranger’s temperature and thought his thermometer was broken. What is a person’s normal body temperature? What would happen if our body temperatures were low? What if they were high? Take your temperature and compare it to the stranger’s. Calendar Skills – Fall begins on the Autumnal Equinox in the Northern Hemisphere, which falls on September 22, 2016. Use your calendar to calculate how many more days there are until the end of Autumn. Fall Leaf Color Graphing – Go out and gather a basket full of random leaves. Make a graph of the different color or types of leaves. Use the leaves for the art project listed below. Or use this cute printable graphing activity. Pine Cone Math – This great activity from Nature Store looks like so much fun. Gather up some pine cones and get to measuring and weighing! Historical Cues – What time period do you think this book is set in? Probably not modern times based on the dress and wallpaper, and a doctor who does home visits. Discuss when the people probably lived and compare their life to your own. Do you live on a farm or in the city? How do they dress differently than we do now? Farm Life – This book would be a great start to a great unit about farming and agriculture. Mr. Bailey was harvesting all of his crops because it was nearly fall. What kind of jobs would he have done in the spring or summer? If possible visit a corn maze, pumpkin patch or apple farm and talk to the farmer about his job. Art Project – Use your fall leaves that you’ve gathered for your other activities to make a leaf collage. Cook up some Fall flavors – Enjoy some time together in the kitchen whipping up a great fall recipe! Try some Cinnamon Apple Chips or my all-time favorite Candy Corn Rice Crispy Treats. Enjoy some music together – There is a beautiful illustration in this book of the family enjoying an evening together with the fiddle and dancing. Put on some great music and dance together in the living room! If you can play an instrument, all the better! Read some more fall books… Continue your learning with more great fall books! 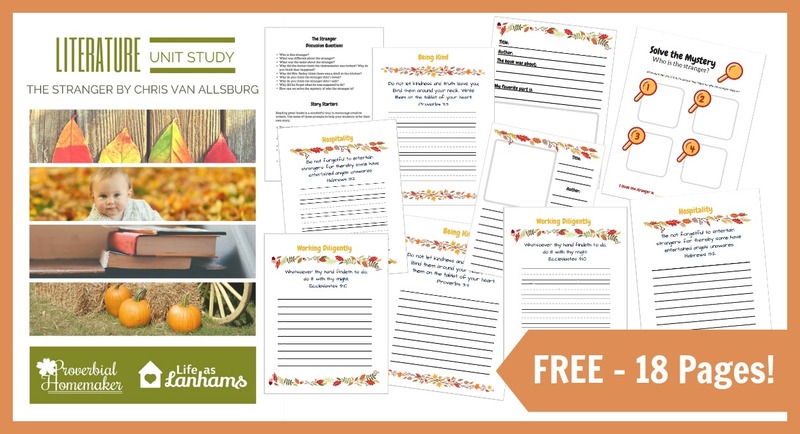 I’ve got a great list with a great printable fall book bucket list to get you started! Download the Unit Study Printable for The Stranger! Thank you for the Unit Study, “The Stranger”. I’m a homeschool mom, & love reading your emails, & articles. May God bless you, & your family. I read The Stranger and thought ‘ wow, someone is doing a unit study of the Albert Camus novel’. Yes I am that girl!